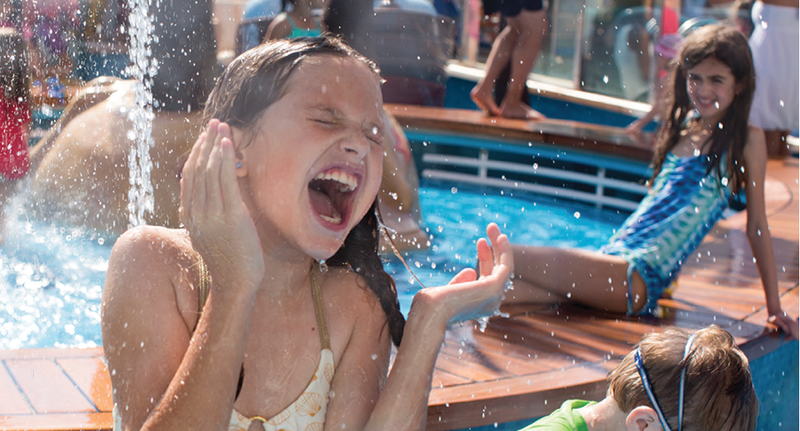 A cruise should be a treasure trove of golden memories – especially for kids. But today’s youngsters are a demanding bunch, so have the cruise lines raised their game? 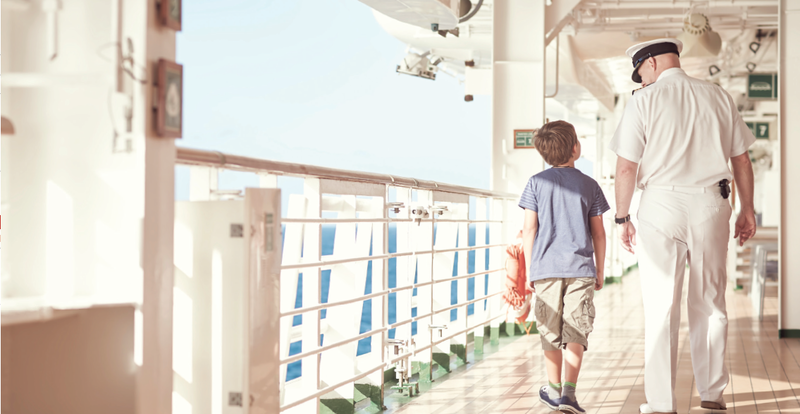 Cruising might just be the perfect family vacation. It’s not only the safe, hassle-free environment that makes a holiday afloat so attractive (though that’s a big plus); it’s the incredible range of activities that today’s big ships provide. From fun-filled nurseries and amazing aqua parks to action-packed kids’ clubs and cool areas for teens, there’s something to keep all junior members of the family happy from dawn to dusk – and beyond – while parents grab some much-needed R and R.
WHY? Royal Caribbean’s kids’ clubs are among the largest at sea, and with adult-only solariums and after-hours nursery care, adults can enjoy grown-up time while youngsters play or sleep. WHAT’S THERE? The Adventure Ocean programme caters for all ages, and the ships are floating theme parks with surf simulators, dodgems and the amazing RipCord experience. WOW FACTOR: Ultimate Abyss, the first 10-storey slide at sea, on the world’s largest cruise ship, Harmony of the Seas. WHY? Norwegian’s trademark Freestyle Cruising, with its informal atmosphere and flexible dining, is perfect for families. a circus school and other fun sessions for youngsters up to 12, while teens will love Entourage, an exclusive lounge and nightclub. WOW FACTOR: Children can meet, and eat breakfast with, SpongeBob SquarePants, Dora the Explorer and other characters, courtesy of the Nickelodeon at Sea programme. WHY? Italians are famous for their love of children, so families always get a warm welcome on this reasonably priced Mediterranean line. WHAT’S THERE? There are dedicated clubs for five separate age groups, special swimming pools for families, and all children participating in the Lego Experience receive a certificate and get to meet the Sailor Walkabout mascot. WOW FACTOR: New All-in-One fares for 2017/18. Single parents pay 60 per cent of the fare for their child, rather than a cabin priced on adult double occupancy. WHY? Voyages from Southampton are geared to Brits, and there are mini-cruises for families just dipping their toes into life at sea. WHAT’S THERE? The Reef club is split into four age groups, with interactive games, shows and challenges including a mini- Olympics, plus an evening nursery when parents want some downtime. WOW FACTOR: New hands-on cookery classes on the flagship Britannia, with baking for under-eights, bread-making for nine to 12-year-olds and pasta-making for teens, plus family classes. WHY? Families with teens will love the exciting shore excursions created in association with TV adventurer Ben Fogle, such as a camel ride, Jeep safari and sandboarding in Abu Dhabi. WHAT’S THERE? Treasure hunts, karaoke and theme parties are all part of the Fun Factory, where children can also have lunch and dinner with the youth staff team. WOW FACTOR: The largest Xbox experience at sea, with interactive games for all the family. WHY? HLC is running seven special family cruises between July and September 2017 on its new ship Europa 2, which has eight family apartments comprising two interconnected areas. WHAT’S THERE? A tailor-made onboard programme for three age groups keeps youngsters entertained, and there are excursions for children and teenagers, such as boat rides, as well as shore tours aimed at families. WOW FACTOR: Children 11 or under, sharing a cabin with two adults, travel free, and it’s only £50 per day for 12-15-year-olds. WHY? Not surprisingly, this line knows a thing or two about entertaining youngsters. WHAT’S THERE? The Marvel Avengers Academy, transforming children into superheroes, and the recently premiered Tangled: The Musical are hits on Disney Magic, while Disney Dream has a thrilling Star Wars-themed area. WOW FACTOR: Castaway Cay is Disney’s private island paradise, visited on Bahamian and Caribbean cruises. WHY? It might provide a more traditional cruise experience, but Holland America offers some of the best Alaskan cruising – and with vast glaciers, dog-sled expeditions and whale and bear-spotting trips, destinations don’t get much cooler than that. WHAT’S THERE? Xbox tournaments, cookery classes and mocktail mixology classes for teens are part of Club HAL’s varied youth programme. WOW FACTOR: The new Koningsdam boasts the line’s first purpose-built family cabins, sleeping up to five, with two bathrooms. WHY? The world’s largest cruise line is big on providing affordable cruises, jam-packed with fun for everyone. WHAT’S THERE? 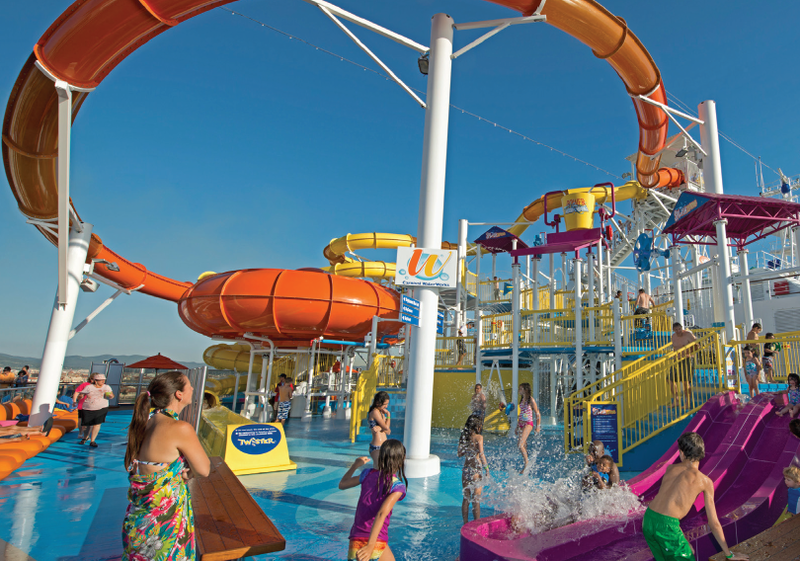 The waterparks are some of the largest at sea, while Camp Ocean recreates the fun of a summer camp, and families can pit their skills in front of a live audience in Hasbro, The Game Show. WOW FACTOR: The SkyRide elevated cycling experience, the first IMAX cinema at sea and the line’s first raft-riding water slide can be found on Carnival Vista. WHY? You get all the family-friendly touches you’d expect from one of the UK’s most popular holiday companies – at sea. WHAT’S THERE? Family-sized interconnecting cabins, buffet lunches with favourites like pizza and spaghetti, and the Thomson Kids’ Club with a great mix of activities. Children up to the age of 12 get discounted rates on shore excursions. WOW FACTOR: Newly launched TUI Discovery is the largest in the fleet and has a rock climbing wall and a brand new show, Splash Live!, with animated characters. If you really want to push the boat out, take a look at Crystal and Cunard. Their names are synonymous with style, and their cruises particularly suit multi-generational families. Grandparents will appreciate the refined atmosphere and evening dances and mums and dads can chill out in chic surroundings, while youngsters up to the age of 17 can hang out with newfound friends. Crystal has a dedicated children’s newsletter outlining activities in the kids’ clubs and around the ship, and is one of the few lines to offer babysitting services in the cabin. There are children’s menus, and both Crystal Symphony and Crystal Serenity have three-berth and interconnecting cabins. Cunard has three age-group clubs, or zones, plus a night nursery. And for a family Christmas they’ll never forget, the line has a 14-night Canary Islands cruise, leaving Southampton on December 22 and including New Year fireworks in Madeira, from £8,796 for two cabins. Jeannine is an Award winning travel writer who contributes to a variety of national newspapers, magazines and specialist websites.